The Mention + Hashtag contest, available in Premium and White Label version, allows to monitor and track new photos or videos published on Instagram and/or Twitter with a brand mention and your campaign hashtag in real-time. When new content is detected, the photo or video will be imported to the contest automatically and it will count as a new participant. Retrieve all the participants that have mentioned the brand on Instagram and Twitter and used the contest hashtag and obtain the username from the social network they’ve participated from. Carry out one or several prize draws among all participants. Display the entries in a public gallery that you can publish in your website, blog, Facebook page, etc. The system will only monitor mentions in real-time. It will not import past mentions. The participating users’ profile should be public. Private profiles are not supported. The publication dates of the posts should be within the entry dates of the promotion. 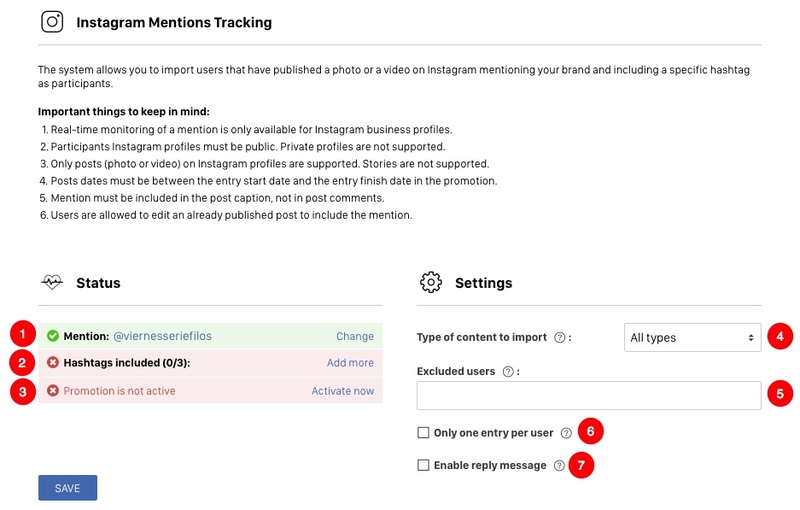 The real-time mention monitoring is only available for Instagram business profiles. Only posts (photos or videos) posted on the profile will be imported. Stories are not supported. The mention should be in the description of the post, not in the comments. Users can edit their post to include the mention as long as the date of the post is within the entry dates of the promotion. 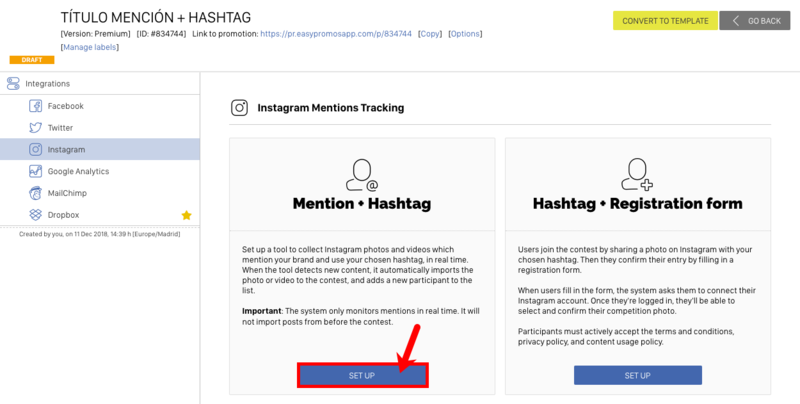 In this article we explain all the steps that you should follow to set up a Mention + Hashtag contest for Instagram and/or Twitter. Follow this tutorial to learn how to set up and run a Mention + Hashtag contest, with all its features. 3. You will be shown a list of the different products available. Choose 'Mention + Hashtag' to create a promotion which can import Tweets, photos and videos from your chosen hashtag. 4. 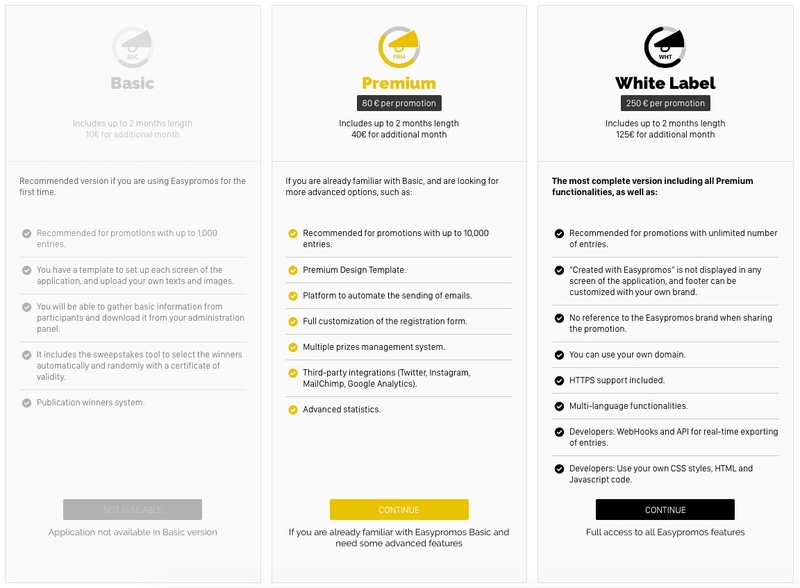 Choose which platform version you want to use: Premium or White Label. 5. Your promotion has been created! In the background, you can see the promotion management page. A pop-up window will ask for some extra information in order to help with pre-settings. If you're not interested, you can skip this step. Default language: Choose the language in which you wish to display promotional content. Country. You can choose to limit participation to one or several countries. Only users with an IP address based in these countries will be able to register. Find out more about country filters. Do you want to link this promotion to a Facebook page (optional): Choose the Facebook page to which you wish to link the promotion. This enables the platform to preconfigure some aspects of the promotion, so it's easier to edit and manage. Header. This displays the title of the promotion, the version (Premium or White Label), and other relevant information, such as the promotion ID number. The promotion status indicates whether the promotion is Draft, Active or Expired, as well as if it’s about to start. Once the promotion period has ended, this field will be marked in red saying: Status: Expired. You can choose what to show on an expired promotion page. Link to the promotion. Use this URL whenever you share the promotion. Learn more about sharing here. The copy link button automatically copies the link to make sharing even easier. Promotion dates controls the phases and timezone of the promotion. Localization limits participation to one or several countries. Learn more about country restrictions here. Next steps: Practical recommendations to guide you in the creation and management of your campaign. Top tip: the promotion ID number (#) is a unique identifier for each promotion. Quote this number if you have to contact the Easypromos support team with any issues. This will make it easier for us to review your settings and help you out. The platform comes with lots of pre-set features, based on which version you have chosen. 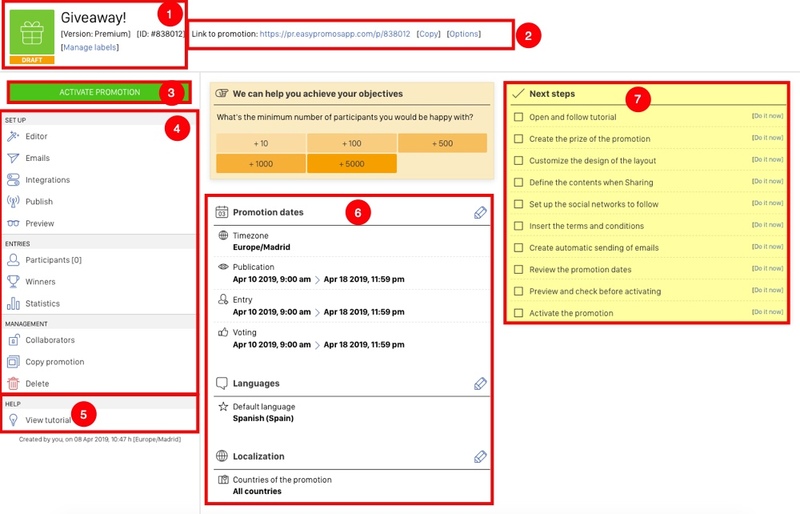 Check through all the options to customize these features for your promotion objectives. Here you’ll find all the platforms with which you can integrate the application. 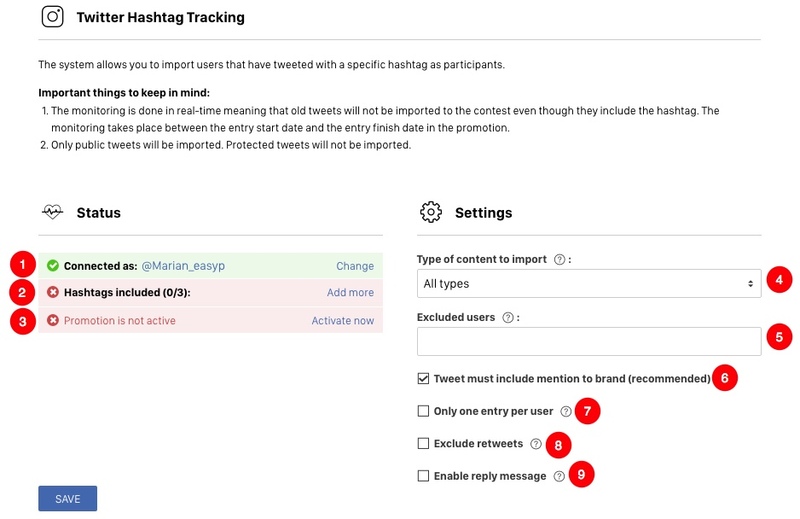 The Twitter integration will allow you to import tweets that contain a mention to your brand with a hashtag that you have defined for the contest. You can import text-only tweets, or tweets with photo and/or video. Users from Twitter can participate if they have an open Twitter account at the time of publishing the tweet. Click on the "Twitter" section to enter the configuration panel. 1. Account connected. By default, the system will configure your account according to the Twitter account you selected in the previous step. Click on "change" if you need to change your account. 2. Hashtag(s). Add the hashtag that Twitter followers will use to submit their photos, videos and comments. You can list a maximum of 3 hashtags. The system will import any Tweet that includes at least 1 of your chosen hashtags. Using multiple hashtags can insure you against spelling variations, mistakes and typos. Some examples are: #ContestDesign and #ContestDesing or #GrammyContest and #GrammmyContest. Important: You can not require users to use two hashtags to enter. When you add hashtags to the list, don’t include the # symbol or any blank spaces. Check in this link the tips that we offer to define the hashtag of your contest. 3. Promotion status. In case the promotion is not activated, the system will warn you, because it is necessary that the promotion is activated to enable the integration. All types: the application will read and import all tweets, irrespective of whether they have photos and videos attached. Images only: the application will only read and import tweets that contain images. Videos only: the application will only read and import tweets that contain videos. Images + videos: the application will read and import all tweets that contain images and videos. 5. Excluded users. Name any Twitter users whose content you don’t want to import. For example, it’s a good idea to add the name of the Twitter user who is organizing the contest. If there are any users making inappropriate use of the hashtag, you can keep them out of the competition by adding them to the list. 6. Tweet must include mention to brand (recommended). This option is enabled by default but it is optional, so you can require users to participate by simply publishing a tweet with the contest hashtag, but that the mention is not mandatory. 7. Only one entry per user. Check this option if you want to limit Twitter users to a single competition entry. Note: It's not possible to import more than one photo or video from the same tweet. If you want users to post multiple photos or videos, each entry should be posted separately in independent tweets, and you should uncheck the box "only one entry per user". 8. Exclude retweets. Check this option if you don’t want to publish retweeted images in the competition gallery. This means that only original tweets will be published. Users will be prevented from repeating competition entries. 9. Enable reply message. Check this option if you would like to create an automatic response to participants on Twitter. You will need to write the message after “@username”, which is a tool will automatically substitute "@username" with each individual's Twitter handle. The integration with Instagram will allow you to enable a monitor that will track in real time new photos and/or videos on Instagram that contain a mention of your brand with a hashtag that you have defined for the contest. When a new content is detected, the photo or video will be imported into the contest automatically, and will count as a new participant. Users from Instagram can participate if they have a public Instagram account at the time of publishing the photo/video. Next, the first step is to connect with the Facebook profile with which you manage the Facebook page that is linked to the Instagram profile where you want to organize the contest. To do this, click on the "Facebook" button. If this is the first time you connect that Facebook account with Easypromos, it will ask you to authorize the permissions of the Easypromos application so that we can show the accounts you manage. Note: In case your Instagram company account does not appear, check this tutorial. 1. Mention. By default, the system will configure the mention according to the Instagram account you selected in the previous step. Click on "change" if you need to change your account. 2. Hashtag(s). Add the hashtag that Instagram followers will use to submit photos, videos or comments to the competition. You can list a maximum of 3 hashtags. If you list multiple hashtags, the system will import any post or comment that contains at least one of them. Use several hashtags as insurance against spelling variations, mistakes, and typos. Some examples are #ContestDesign and #ContestDesing, or #GrammyContest and #GrammmyContest. Important: You can not require users to use multiple hashtags to enter. When you add hashtags to the list, don't include the # symbol or any blank spaces. Check in this link the tips that we offer to define the hashtag of your contest. All Types: the application will read and import both photos and videos from Instagram. Only Photos: the application will only read and import photos. Only Videos: the application will only read and import videos. 5. Excluded users. Name any Instagram users whose content you don’t want to import. For example, it’s a good idea to add the name of the Instagram user who is organizing the contest. If someone is using the hashtag inappropriately, you can exclude their posts from the contest by adding them to this list. 6. Only one entry per user. Check this option if you want Instagram users to have a single competition entry only. Note: It's not possible to import more than one photo or video from the same post. If you allow more than one entry per user, each photo or video should be posted separately in independent posts. 7. Enable reply message. You can enable an automatic reply message, which will be automatically sent to the user after uploading the photo in his Instagram account. Important! Users are allowed to edit an existing post to add the mention and the hashtag, but the system will only be able to import this post if it was published within the participation dates of the promotion. If you’re not interested in presenting competition entries in a public gallery, then go directly to Step 7 of this tutorial. 1. Enter the promotion “Editor”. Change the provisional title for one that highlights the best of your promotion. Make it sound as attractive as possible to users! Format the text and upload an image to make the page more dynamic. Change the provisional description to explain exactly how users can take part. You can also customize the ‘Enter’ and ‘View entries’ buttons. Note: If you want to enable participation via Facebook or microsite, go to Pages > Form. Then, in the "Form fields" tab, review the data that you want to request from users who register for the promotion. By default, the gallery will display tweets and Instagram posts with images and text. You can edit the gallery display on the Entry form page. If your contest is only for tweets without images, delete the "Media field". If your contest is only on Instagram, and you are not interested in including text in the gallery, delete the "comments field". By default, the contest will import both pictures and videos, but you can change this behaviour, you can modify the "Media field" by clicking on the "Media type" option. Attention! Make sure your settings on this page match your settings in Integrations > Twitter and Integrations > Instagram. 1. Contents: Upload a header image to give the gallery a more sophisticated design. You can also add an introductory message, to welcome viewers to the gallery. 2. Layout: In a Hashtags Contest, the gallery has a "mosaic" layout by default. Multiple photos are shown on each line, creating a visually attractive collage. Switch to Tiled Gallery. If you’d prefer to present each participation (photo, text, and video) on a separate line, uncheck this box. If your contest is text-based, or it accepts text-only tweets, you can choose to display texts as quotes. Learn how to set up these quotes in a range of colours. You can edit the maximum height of images in the gallery. Find out how to resize images in a tiled gallery layout. You can also activate the promotion footer and customize its texts. The promotion footer is a banner displayed at the bottom of each promotion page, which can include links to your social networks and legal material. You can completely customize the look and feel of your promotion to match your brand, product, or promotional theme. Colors: Change the colors of the texts and the action elements (such as buttons) in the promotion. Background: Customize the background of the promotion with your own image or choice of colour. The background will be the same for each page of the promotion. CSS Styles (White Label only): Use your own CSS to completely customize the template. Click here to discover all the potential of the Design module. If you want people to visit your gallery or vote on entries, it’s very important to create effective viral content. Viral content is the message displayed when participants share the promotion, and invite friends to view or vote in the gallery. A motivating message and images will encourage users to share and take part! Viral image: This image will accompany the share text. To optimize for social networks, we recommend dimensions of 1200px by 630px. The same image will be shared on Facebook, Pinterest and Google+. If you don’t upload a specific image for this section, the main promotion image will be displayed whenever participants share. Generic content: This text will be shared on social networks when participants use the share buttons on the main page, the registration form or the gallery header. Learn how to edit generic content. This message will be shared when participants use the share buttons on the Thank you page. Increase engagement by asking users to vote for their favorite entries. Start by updating the gallery settings in Editor > Pages > Gallery > Votes. Learn more about how the voting system works. Note: Learn how to set up consent to the legal texts of the promotion. Use My Networks to customize the page which users see, just before they finalize registration. You can encourage them to Like your Facebook page, for example. My Networks can be set up for Facebook pages, as well as Twitter, Instagram and Youtube accounts. Learn how to do this here. The promotion footer is a banner, presented at the foot of each page of the promotion. You can also customize it, or deactivate it if it doesn’t interest you. Restriction by country: You can limit the promotion to a specific country or countries. Only those users who connect from the selected country or countries will see the promotion. Learn how to enable country restrictions here. Restriction by age: You can limit the promotion to users whose age is higher than the one indicated by the administrator. This establishes a minimum age for participation. Learn how to enable the age verification window. Before or during the promotion, you can choose to display the prizes available on a public page. The same page will show the winners of each prize, once there are winners. You can choose whether to publish the prizes page from the beginning, or wait until the winners have been selected. To customize and publish the winners page, go to Editor > Pages > Winners. Check out the Prize Management tutorial to learn more about your options regarding prizes. Once you’ve set up the promotion to suit your campaign goals, go to the Promotion Management Page to activate the contest. You can also view billing information and make payments from this page. The next step is to publish the hashtag gallery. If you do not want to display competition entries publicly, you can skip this part of the tutorial. Use the Easypromos Widgets feature to embed the gallery directly into your webpage, microsite or blog. The Widget provides a variety of customization options. For example, you can set up the width and height of the gallery in order to adapt it perfectly to your website's design. If you wish, you can publish the gallery as a tab that you can install on your Facebook page. Use the tab to make your gallery more visible on Facebook and raise the profile of your promotion. You can use the gallery's unique URL to share it via any communication channel. This includes social media, email newsletters, blogposts and more. Find this URL in the “Links to the promotion” section, explained here. Note: Click here to learn how to set up the Full Screen Gallery. It will also be important to share the promotion through several channels. As users will participate via Twitter and/or Instagram, the main dissemination should be done on these channels, and above all, communicating the hashtag that should be used in order for their picture to be imported to the contest. Remember that users' profile must be set up as public in order for their pictures to be imported. Review this article with 10 ideas to spread your promotion on Instagram. You can also use the main link of the promotion if you want participants to be able to access the welcome page to know more information and view the hashtags gallery. Tutorial: How to disseminate a promotion. In "Participants", you can view information about all participants and download it as an Excel file. Remember that Twitter and Instagram participants don't have to complete a registration form, so they will have less data. Add entries that haven’t been imported automatically. Go to “Statistics”, in the left-hand menu on the promotion management page. From here, you can view participants and how they interact with the promotion. Remember that users who participate from social networks via hashtag don't have to register on the promotion microsite, so we won’t have any data on them. This information will be available even after the promotion has finished. Learn more about the information you can access in this section. When the participation period of the promotion ends, use the prize management system to create prizes and decide how they will be awarded. You can award prizes randomly or manually. Randomly: You can run one or more sweepstakes among all participants, or a segment of participants. You'll receive a certificate of validity with the results. Manually: You can assign one or more prizes manually to participants. This is useful for contests with voting or skills tests. We also recommend this option when the winners are selected by a jury, notary public, or the organizing brand. Learn how to create prizes and select winners with the Prize Management tutorial. The end of a promotion is controlled by the dates set up in the promotion Editor. When the "End of publication date" is passed, the promotion status changes from active to expired. By default, the promotion is unpublished and is no longer visible. If users try to access the promotion URL, a screen with the message "promotion expired" is displayed. You can choose to edit the content of this "promotion expired" screen. You could republish the promotion so that it is visible again, show the winners of the promotion, or keep the contest gallery visible. Learn more about your options for expired promotions.